It is not a secret that wireless, noise-canceling headphones make you pay through the nose. With this on our mind, we knew that the less pricey options cut down on a lot of features, quality of the soundstage, and deliver an unattractive look. Testing BÖHM B-66 Wireless Bluetooth headphones, with Active Noise Cancellation, we found the crispy sound, stable connection, and aluminum covered build fascinating. In addition to that, the leatherette pads felt plushy and brought the comfort to our ears. In order, to put all our impressions on paper, we wrote this detailed and compelling review, which unveils what makes these headphones so good. Read on! As soon as you start reading the features, you will know that the BÖHM B66 have everything necessary to provide the mesmerizing musical experience. The features include the active noise cancellation technology, wireless Bluetooth pairing, excellent battery life, and much more. This model is sufficiently better when it comes to the Bluetooth range, outperforming some far pricier models on the market. It is saddening that Bohm couldn’t implement the newest Bluetooth 4.1 technology. But, Bluetooth 4.0 version is ideal for people who don’t pay too much attention to the latest technologies. The CSR chip accompanies the Bluetooth technology for the outstanding audio performance. it is a ROM solution for the Bluetooth devices with the Qualcomm aptX codec which enhances the stereo during the Bluetooth streaming of the music. Additionally, it extends the phone calls and enhances their quality, and also takes pride in the voice recognition commands various models have. Bluetooth 4.0 on the Bohm B66 connects quickly and efficiently. The supported range is up to 33 feet (10 meters.). It doesn’t hurt to mention that the Bluetooth supports various connection protocols which include: A2DP, AVRCP, HFP, and HSP. The passive noise cancellation, achieved through the various enhancements in the build and design does a sufficient job in preventing the noise outburst in the loud areas, such as the buses, planes, cafes, and noisy office environments. The Active Noise Cancellation, as well, provides a safeguard from the noise entering your ears and interrupting your phone calls and music sessions for the price. But, unfortunately, for an audiophile veteran, the noise cancellation capabilities might not suffice. The more premium headphones do a better job closing out the noise with this technology. However, we shouldn’t be too picky and call these headphones bad, because you certainly can’t ask for better with only $100 budget. You can easily maneuver the active noise cancellation, by switching the button on or off, which is located on the headphones themselves. The powerful battery implemented in this model is powerful enough to cope with some of the best Sennheiser headphones. It charges within three hours and is capable of withstanding up to 16 hours of stereo music and 18 hours of communication. The fact that the headphones are suitable even for the traveling, and longer flight sessions, is even more thrilling for all music lovers that are looking for the inexpensive pair of powerful headphones. The BÖHM-B66 is compatible with all the Bluetooth supported devices, including the latest Apple’s phones and tablets, just like the Android devices there are. Additionally, you can pair them with a Bluetooth supported laptop or desktop computer, or a Smart TV. So many options for you to flawlessly enjoy your favorite music, movies, and phone calls with your best friends. The features make these headphones really versatile and unique. While this is expected to be seen on the most premium models, Bohm managed to unite everything we want from an affordable pair of headphones and put it in an under $100 model. Gold with the skin-themed and Tanned accents. Both models look perfectly wonderful, and on first sight, they seem much more expensive than they primary are. The black and silver textures look gorgeous and decrease the visual bulk of these headphones. They weigh around 167 grams, which is a perfect weight for the wireless, noise-cancelling headphones. This portable model will be sure to never take the excessive amounts of space in your bag or rucksack. The metal construction of headphones is covered in an aluminum and metal alloy, while the cups feature a leatherette protein for the lasting comfort. How many times did you find yourself spend hours listening to your favorite music or watching movies? Bohm has taken everything into consideration and created a model that adjusts to your head accordingly, which is a great plus compared to the other on-ear headphones. The construction and build quality are merely satisfying. Although it is not recommended, the headphones will stand severe abusing like a champion. However, don’t test their limits, even the strongest headphones fail when you push too much force on them. The only thing we minded is that the swivel mechanism gets loose after a while of abusive using. So, in case you decide to spring for Bohm-B66, keep in mind that the gentle usage of swivel adjusting is essential. The features in terms of design are amazing. We shouldn’t forget to note that Bohm B-66, along with the detachable cable, and USB charger comes with a sturdy case which successfully prevents the damage from the headphones when you are on the go. It is not a secret that Bohm is an unknown brand compared to Bose, Sennheiser, Audio-Technica, and Sony. However, that didn’t stop them from creating a powerful pair of headphones that can outperform the vast majority of brands that we numbered. The sound is the most important section of individual headphone’s performance, the rest is not as important, which is why we are first going to explain the sound quality. The BÖHM B-66 sports two powerful 40mm drivers which deliver impeccable audio output, rather seen on more professional $150+ models. The bass is extremely punchy and powerful. However, it is good that it won’t break through the instruments and vocals. The mids are prominent, while the highs are warm, detailed, and dynamic. The sound output is the one most budget-friendly headphones don’t have, and the vast majority of audiophiles cannot afford. The frequency range of the headphones is 20Hz-20KHz, which means that you will be able to hear every detail proficiently while listening to the music, while the Apt-X in Bluetooth will deliver crispy stereo. The controls are located on the panels next to the leather cups. The controls are intuitive and easy to use, and commands include the volume up and down, next or previous song, and answering the calls. The headphones are equipped with the inline microphone which allows you to intuitively make calls and answer them. The microphone has strong, and crystal clear sound input, and thanks to the noise cancellation, you will be able to hear your conversant clearly. When you get the call, the music stops and continues playing when the call is over, which is extremely intuitive, and you won’t have to pull out the phone to maneuver your call list. The performance of the BOHM B-66 is indeed amazing, which is why we intended the five-star rating for them. Shopping for the right pair of headphones, especially with the noise cancellation, and all these features are challenging and difficult. Bohm delivered a top-notch pair of headphones. There are cheaper options. However, in order to keep the price cut, the other manufacturers had to cut down at least one more feature, risking the value, portability, or durability. All, in all, BÖHM B-66 is an ideal buy for the budget-friendly, on-ear headphones. Audiophiles can occasionally find the small noise leakage. BÖHM B-66 is a relatively inexpensive model with a great variety of outstanding features. If you can put up with the small noise leakage in the noise cancellation, it is a perfect model suitable for every need. BÖHM B-66 is an under $100 model of wireless, headphones streamed through the Bluetooth 4.1 technology with the CSR chip. 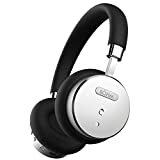 In addition to a wonderful set of features that include the great compatibility, and beyond-average battery life, headphones have average active noise cancellation, durable construction, and great audio output.